In a little over a week I’ll be starting the OTN Asia Pacific (APAC) Tour 2016, or to be more accurate I’ll be starting the first half of it. I’ll be attending the following events. The tour carries on without me (I had already committed to another event in Europe) to the following locations. I’m feeling pretty nervous about the travelling. 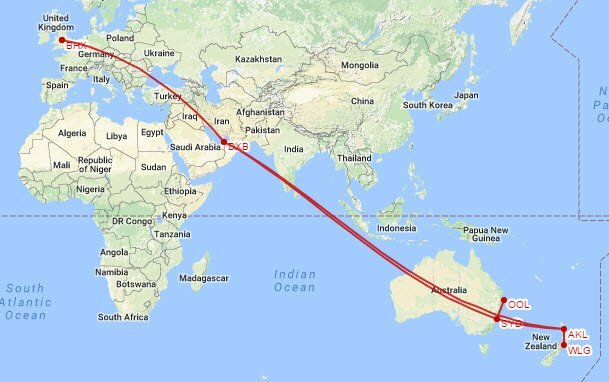 The Dubai to Auckland flight alone is 16+ hours. It’s a long way to go for such a short visit, but I’m sure I will enjoy it when I’m there. I did try to upgrade the flights to business class, but there were no seats left. I’ll keep trying. It will cost me a lot of money, but it will make the whole traveling process a lot more pleasant if I can sort it out. Author Tim...Posted on October 15, 2016 November 3, 2016 Categories OracleTags ace, aced, APAC, asia pacific, australia, new zealand, Oracle, otn4 Comments on OTN APAC Tour 2016 : It’s Nearly Here! The Melbourne class was a little bigger than the previous classes, with 12 people including several people from Oracle Support. Being the 3rd class in quick succession, everything felt really smooth, with no real surprises. I actually managed to get a reasonable amount of sleep before both classes, which was a bonus. Saying that, I fell asleep at 20:00 last night, so I ended up waking up at 03:00, which gave me some time to play catch-up with emails and forum questions. It does mean that today will end up being a pretty long day, since my flight to Hong Kong isn’t until 00:15 (including a slight delay). Apparently there have been typhoon warnings in Hong Kong and the schools have been closed, but surprisingly it hasn’t really affected flights. Let’s see how that works out. This was my third visit to Australia, but only my second visit to Sydney and Melbourne. The real take-home message from this trip is I felt really at ease all the time I’ve been in Australia. I’m not surprised a lot of British people decide to move to Australia. It’s probably one of the easiest places for a Brit to relocate to. Update: I’m in the hotel in Hong Kong now. No signs of a typhoon, but I’ve received a mail saying the class may be cancelled if the weather is too bad. Weird. I’m just off to lunch in the tallest building in Hong Kong, or so my mate tells me. I’m now sitting in my hotel room in Melbourne, so the Sydney experience is complete. Day 1 went smoothly. I got a few questions that made me think, which is always good. Once I had finished the class, it was straight off to the train station to get into town to speak at the Oracle Meetup organised by the Pythian guys. The train journey took longer than I expected, so I arrived about 20 minutes late, by which point the projector was irretrievable locked away. So instead I did my presentation with my laptop pointing at the people around the table and did a lot of zooming. 🙂 Despite this setback, which was totally my fault, it seemed to go OK.
It’s always good to meet new people, but I was especially happy to finally meet Nuno “Noons” Souto and Gary Myers, whose blogs I’ve been following for ages and who have both helped me in the past by correcting my numerous mistakes. After the presentation finished and we had an informal chat, it was back to the train station and then the hotel. This morning was a 06:30 flight to Melbourne, so I had to get up at about 04:00 to get ready and get the taxi to the airport. I actually woke up at 03:00, so I guess I’m going to feel a bit rough later. Luckily I’ve got the rest of the day off to recover before I start the Melbourne class tomorrow. I arrived yesterday afternoon in the Gold Coast and got a bus to my hotel, the Conrad Jupiters Casino. My first impression of the Gold Coast was not too good. It is essentially a big holiday resort. The fact I was staying in a casino gave me a bit of a flashback to Vegas. On arriving at the hotel I noticed there was a pool, so I went straight out and had a swim. This made me feel a little more positive. Then I noticed there was a gym with a room where they teach fitness classes. The room was empty so I went back to my room, got my Yoga mat and did an Ashtanga practice. It was cool not having to practice in my hotel room. Too many distractions. After this I was feeling up for a wander around. After leaving the hotel I walked through a shopping center and a restaurant area, then out on to the beach. This is when I realized I was going to like the Gold Coast. The beaches are long and wide with white sand. It is the perfect place to bring kids on holiday, hence the holiday resort developments. I’ve got 2 days before the conference starts so I’m going to spend my time between the beach, the gym and the pool. I’m going to try and blank out the casinos and holiday resort feel as they will only spoil it for me. I would post photos only the hotel internet charges are extortionate, so I’m using a public terminal. Unless I get internet access at the conference, I probably won’t be online much until I reach New Zealand. I went down to check out the harbour and took a ride on the Manly ferry. I know it’s a bit stupid, but the opera house is so iconic, I really feel like I’m in Australia now. It was getting dark by the time the ferry came back from Manly. I walked home through a park and saw a bloody big rat. I was going to photograph it and make some joke about Quokkas, but I was too slow. A little further on I heard a noise in a tree and saw something a little cuter than a rat. Tomorrow is my only full day in Sydney before I go on to Gold Coast, so I’ve got to figure out what to do to make the most of my limited time.